Paul Warwick taken on to promote application innovations at company. 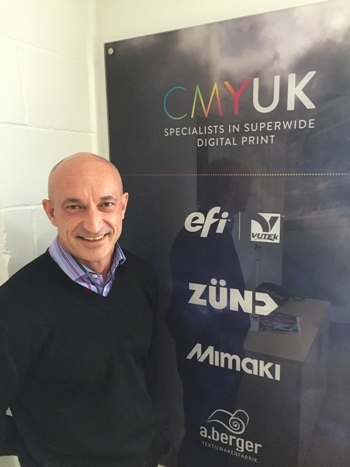 Paul Warwick, new business development manager for consumables at CMYUKCMYUK, a leading UK solution specialist in super-wide digital print and the UK’s long-term partner of EFI has appointed Paul Warwick as its new business development manager. Warwick’s role is to bridge any gaps in the market between media and machine, using his knowledge from across the industry to develop application-led solutions that help clients grow their businesses. With almost 30 years’ in the print and consumables industry, Warwick has worked across the entire distribution channel and Michael Crook, Commercial Director, consumables division says that this extensive experience within the wide and super wide format consumables trade were key to his appointment. “Warwick has years of experience in the print industry, including textile and digital wall and floor coverings, which gives him a great understanding of what our customers do and how the materials in our portfolio can add value for them,” said Michael. Warwick, appointed in June 2015, says he has been visiting clients across the country to help them find the consumables they require, specifically looking at high end, high margin products that allow for innovation and forward thinking. He said: “I’ve worked along the entire supply chain since I was 18 – starting with deliveries and sales for my dad’s company, through roles in both consumables and hardware with manufacturers, distributors and retailing to end users – so I understand the roles of sales people at each point, and what they need from us. “As well as identifying and sourcing the right product for a client’s needs, I work alongside them to troubleshoot any issues, and can bring the manufacturer in on that testing where there is a specific development need. “CMYUK isn’t just a ‘me too’ company that happens to carry the standard stock for its machines – we also have stand-out ranges like the Berger Textiles, and the Utack product that we introduced six months ago has seen a huge growth in sales.